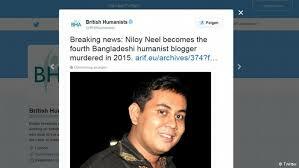 Freedom of speech has become bloody in Bangladesh. The radical and extremist groups there wants to shush all the voices which are liberal or talk against them. so called Suspected militants posing as tenants entered an apartment building and hacked to death a secular blogger in Bangladesh's capital in the fourth such deadly attack this year, police said. He is not the first and may be he is not the last. Whosoever have clash with those extremists ideologies will pay for it. You speak you die, you remain mum you live. But is it possible for a person to remain silent when he sees so much wrong around him? He was the voice against extremism and fundamentalism. He spoke for the minorities and he was killed mercilessly for being humanist and secular. Hours after the assault, Ansar-al-Islam, which intelligence officials believe is affiliated with al-Qaeda on the Indian subcontinent, sent an email to media organizations claiming responsibility for the killing and calling the blogger an enemy of Allah. The authenticity of the email could not be independently confirmed. The U.S. State Department condemned it as a "cowardly murder." No arrests were made even after the FIR. Detectives say radical groups were behind the previous attacks and have made some arrests, but have failed to make any major headway into the killings. The family and friends said Chowdhury had sought police protection after he was threatened but police asked him to leave the country for his safety. This is the real face of earth, where a person with mind and thoughts will be silenced forever. May be this region where we are living in, is the most dangerous place for human beings with mind, poverty or femininity. So who should we ask for saving us? Or should we escape from our lands? But is it possible for all of us? No, When those who rule us will be targeted like this, then may be judiciaries and law enforcement agencies would work, Till than no mercy from the followers of the most merciful religion on the earth.